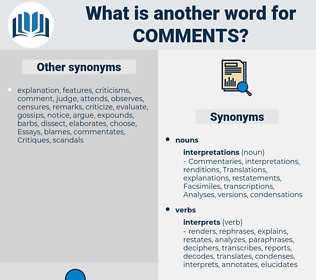 What is another word for comments? observation, remark, remarks, commentary, commentaire. commentators, pronouncements, footnotes, utterances, remarks, commentary. 2011, 819, 14, 4, 11, 12.
comentarios, Regulations, remarques, services, Agencies, insights, proposals, Suggestions. document, considerations, notification, notifications, information, arguments, description, committee, Suggestions, commission, reply, Replies, points, administration, Perceptions, community, position, positions, perspective, perspectives, decision, department, action, record, answer, C, location, important, delegation, overview, critics, Ms., glance, court, america, suspends, sightings, poster, plant, health, highlights, data, policy, quick, forum, des, KUFPEC, heading, Ideas, us, media, 5G, group, stand, june, read, office, main, january, state, saturday, Avis, united, fast, july, canada, S, party. announcements, statements, commitments, complaints, instructions, communications, components, documents, reactions, clarifications, comentarios, conditions, Sentiments, assessment, assessments, explanations, contentions, descriptions, declaration, declarations, Testimonies, requirements, viewpoints, outcomes, criticisms, assertions, proclamations, contributions, objections, accusations, Respondents, petitions, concepts, Judgments, interventions, participants, allegations, cooperation, specifications, amendments, quotes, considers, appreciations, impressions, responses, conclusions, developments, modifications, concerns, questions, words, discussions, Measurements, columns, reports, memos, terms, indications, matters, deliberations, attention, manifestations, references, affirmations, me, sections, qualifications, articles, Evaluations, directions, advices, detections, minutes, briefings, Communities, supplements, topics, interveners, specifics, sentences, memoranda, decisions, reservations, narratives, Critiques, expressions, editorials, factors, events, Intentions, accounts, informants, speeches, actions, Records, courses, demonstrations, secretary, encounters, hints, expositions, codes, presentations, operations, answers, facts, timelines, initiatives, Memoirs, formulations, proceedings, Voices, purposes, exhibitions, allowances, Attitudes, inferences, responders, tell, recommends, messages, delegations, panellists, chairperson, methods, occurrences, pointers, institutions, item, items, estimates, outbursts, Addresses, entitled, debates, reflexiones, Resources, observers, Entries, attaches, inspectors, provisions, Organizations, Countries, teams, times, Motions, themes, inputs, remarques, demarches, misgivings, situations, results, phrases, procedures, elements, acts, Analyses, things, objectives, services, recitals, L, Persons, additions, interests, indicators, respects, edits, warnings, materials, authors, Observatories, VOTES, Deficiencies, returns, ec, Measures, issues, refers, protests, versions, briefs, wordings, reserves, exposures, Languages, text, formulated, declared, so-called, qualifiers, assets, Charges, actors, develop, permit, ratings, Ones, insights, thoughts, appraisals, posts, approaches, future, options, agency, noises, particulars, Emphases, proposals, Efforts, changes, talks, Guidelines, please, claims, reasons, propos, numbers, referees, councils, express, expresses, subjects, ways, document, dots, lyrics, signals, eyes, aspects, Stations, audio-visual, requests, grounds, speakers, parts, annex, sales, people, Difficulties, considerations, stakeholders, advisers, Stories, images, labels, challenges, judges, rates, rulings, roads, systems, tasks, individuals, Areas, members, boards, presented, pins, Visions, visits, add, tips, features, values, Memories, levels, see, Rights, marks, Surveys, wishes, notifications, OBS, paragraphs, cables, players, cases, _, regular, aims, arguments, 2007, holdings, Was, deals, Subsidies, Forms, discusses, affairs, signs, 206, Suggestions, calls, think, meetings, Replies, Parties, 97, points, 105, date, Perceptions, feelings, sides, vi, positions, perspectives, LINEs, goods, C, critics, suspends, sightings, highlights, data, heading, Ideas, media. 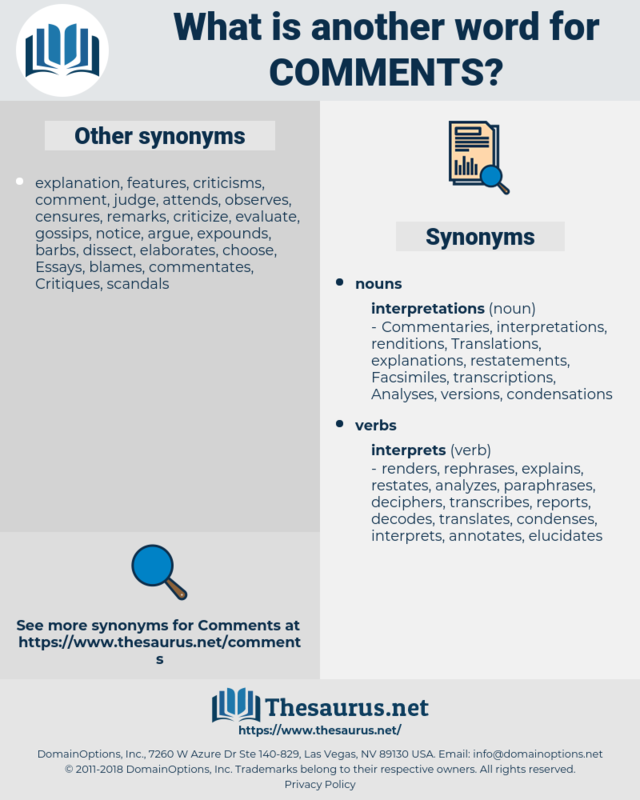 concerned, Explained, Indicated, speak, spoke, concerns, proposed, Referred, Were, talk, reflected, said, received, Provided, suspended, used, revised, Supplied, found, stated, presented, made, thought. Mentioned, criticized, Consulted, concerned, invited, Introduced, voiced, monitored, advised, responses, addressed, designated, expected, proposed, employed, quarantined, known, Submitted, included, reflected, said, received, Provided, expressed, answers, sent, Reached, tabled, heard, raised, put, held, sought, given, stated, dated, presented, made, based. explains, indicates, observes, says, actions, shows, remarques, lets, considerations, information, points. He wandered on with his questions and comments. He and Miss Wycliffe had a full view of the room, to which the Parrs had shown their indifference by turning their backs, Mrs. Parr being absorbed in her own excited comments upon the scene in the opera house, while her husband was earnestly employed in the business which had brought him to that place.